With a good set of storage shed plans you can build your very own shed that can house your lawn and garden equipment, tools and anything else that you might not want to keep inside the house. Depending on the size of your shed and just how elaborate you want to make it, you can spend anywhere from about $500 to $5,000 in the cost of materials. For the shed that will be described below, your cost should be roughly $1,000 and 2 full days of labor. Before you can start, you will need to find a suitable place on your property to place the shed. Ideally, it should not be too far from your house and should be on a fairly flat piece of ground. The size of the shed can vary depending on your needs. It is always better to build it a little too big than a little to small. 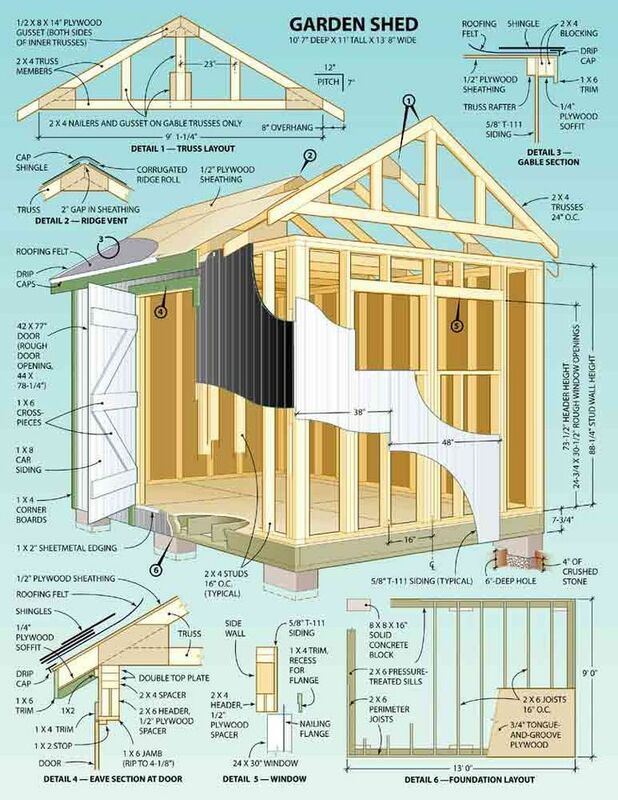 The following small storage shed plans call for a structure roughly 16 feet long, 8 feet wide and 8 feet high. The open roof will add another 2 feet or so in interior space. Start by marking an 8 foot by 16 foot rectangle on leveled ground. Next, you will need to dig postholes about 2.5 feet deep in each corner and every 4 feet on the sides and back of the structure. Using 6”x 6” 10 foot posts sink them to a depth of two feet and fill each hole with concrete. Once the concrete has set, you are ready to start framing the floor and erecting the walls. To frame the floor, you will need to use pressure treated 2” x 4” lumber. Connect the 4 corners with the lumber to form a rectangle. Install floor 8’ floor joists every 2 feet and then nail down ¾ inch plywood to form the floor. Build the frame for each wall by using 2”x 4”s and then attach them to the posts that you had installed earlier. Be sure you have an 8 foot opening in the center of the front of the structure. That is where the double doors will go. Attach ½ inch plywood to the frame to form the walls. Using heavy duty hinges, attach two 4’x 8’ doors of reinforced ½ inch plywood in the center front opening. Next, you are ready to build the roof. Make a series of triangular trusses that can be attached to the top of the frame of the shed. Once secured, layer with plywood and then cover the plywood with tar paper roofing shingles. Make sure the shingles overlap so rain will drain off them and not between them. Your basic structure should now be complete. You can add some shelving and maybe a storage rack inside. An inexpensive indoor/outdoor carpet can be glued down to the plywood floor. To add the finishing touch, get yourself a few gallons of your favorite colored paint and paint the entire outside of your plastic storage shed. Take a little break and then start loading the shed with all of your stuff.